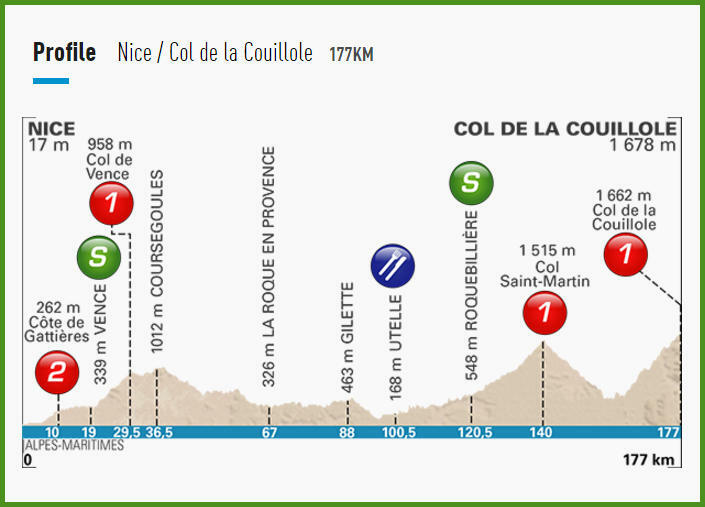 No less than three 1st-category climbs are in store in Stage 7, the last of them being the summit finish of the Col de la Couillole. Km 10.0: Côte de Gattières – Cat. 2, 4.5 km at 4.8% avg. Km 29.5: Col de Vence – Cat. 1, 9.7 km at 6.6% avg. Km 140.0: Col Saint-Martin (La Colmiane) – Cat. 1, 7.5 km at 7.2% avg. Km 177.0: Col de la Couillole – Cat. 1, 15.7 km at 7.1% avg.